Stars didn’t line up for us to photograph Wendy and James’ wedding last year unavailable for their wedding date last year, but that didn’t stop them from hiring us to take some photos on their first anniversary! Not only that, but they decided to get back in their wedding clothes for the occasion. 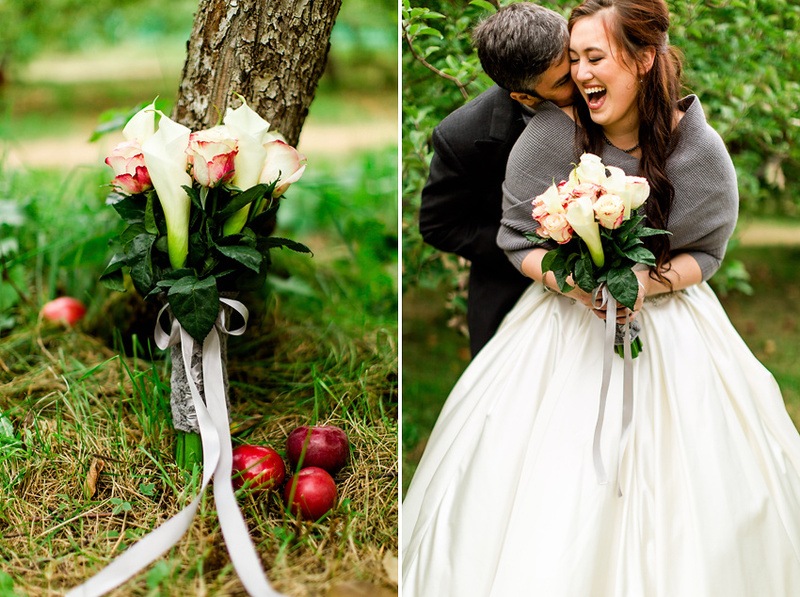 They had their first date at an apple orchard, so we planned the photo shoot at the beautiful Verger Labonte apple orchard just outside of Montreal. It really was something special. Wendy and James are head over heels in love with each other and it shows immediately. We had an absolute blast getting to know them, cracking jokes and just spending time with them made us feel like we’ve known them forever. Wendy and James, we see how wonderful you are together and we wish for you to grow in your love every year! Thank you for choosing us for this special occasion. This was our last wedding of the 2015 summer season and we could not have asked for a nicer couple for an amazing season finale! The weather was perfect, the guests were wonderful and really knew how to party! We were thrilled to see some familiar faces and made some new friends so I’m sure we’ll be seeing Sareda and Calvin at another party in the future. Sareda and Calvin were just as wonderful as we remembered them from their waterfront engagement session last year. The ceremony was held at the beautiful Billing Bridge Estate. The historic building and picturesque grounds provided for sun kissed moments which we captured on our cameras. We couldn’t wait to head to the party since it was at the ever so popular Yangtze Restaurant in the heart of Ottawa’s Chinatown. As usual the delicious meals consisted of many traditional courses and every single one of them were just amazing! Then, as expected, the louder the music got, the more Ciroc bottles started popping and the dancing was out of this world! Calvin even had a GoPro mounted Ciroc bottle that was passed around on the dance floor making for some amazing footage. We had some pretty hot days this summer! With that said both Magda and I are so proud to work with couples who don’t let the heat get in the way of taking beautiful photos. Carmen and Minh looked absolutely stunning on their gorgeous (and hot!) wedding day. The day was perfect. From touching tea ceremonies, to the beautiful ceremony at the Billings Estate in Ottawa, to the experimental farm for photos and finally to the always amazing Chateau Laurier. Not only was the young couple easy and fun to work with, but we also have to thank the bridal party for being so accommodating and sweet. Carmen and Minh, thank you for bringing us on the journey with you! It was beautifully special and we can’t thank you enough. Here are a handful of our favourite moments from the day, as well as a slideshow. We wish you a wonderful life together!